The Prime Minister Nawaz Sharif’s counsel Makhdoom Ali Khan Thursday (today) denied that Nawaz Sharif had been a director of the family’s Dubai factory. Makhdoom Ali Khan contended before a five-bench larger bench hearing the Panamagate case that no law can hold the premier questionable for his son’s business. “PM Nawaz was not a shareholder in Gulf Steel Mills,” Khan upheld. Justice Ijazul Hassan observed that the prime minister had recognised the Dubai mills and said all records are available. “Now the burden of proof is on you,” he told the PM’s counsel. Khan was of the opinion that presenting documents and proof is the petitioner’s job. However, Justice Asif Saeed Khosa observed that none of the records submitted in SC suggest PM Nawaz was not a shareholder. While the counsel argued that the premier did not lie before the Parliament, he admitted that there were some omissions in PM Nawaz’s speech. “PM Nawaz only gave an overview of his business in the speech, however, there were some omissions in it,” the counsel stated. Meanwhile, Justice Khosa observed that PM Nawaz had failed to give a reference about Qatari investments in his speech. “If there were some omissions in PM Nawaz’s speech, should it be termed as a lie or half truth?” he observed. “What implication will Article 66 have, which states proceedings of the parliament cannot be challenged by any court of law,” Justice Ejaz Afzal Khan questioned. Moreover, Prime Minister Nawaz Sharif’s counsel told the Supreme Court that the premier is not answerable to anyone for his son’s business. “The lawyer of Hassan and Hussain Nawaz will present details about the business and the money trail record,” Makhdoom Khan said. 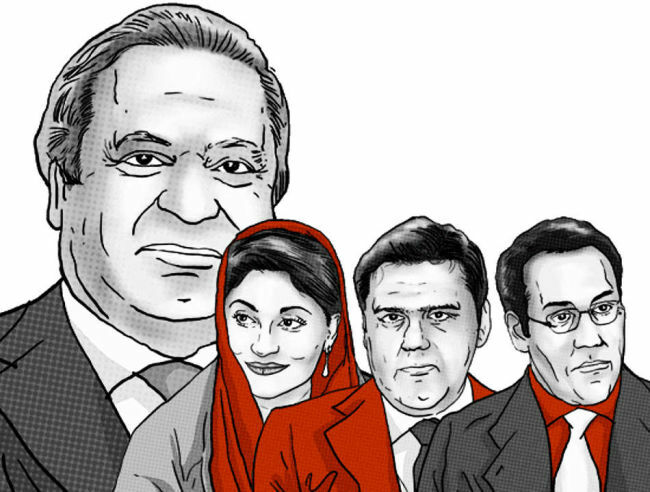 Earlier, Pakistan Tehreek-e-Insaf (PTI), counsel Naeem Bukhari, while concluding his arguments in the Panamagate before a five-judge larger bench of the apex court on Wednesday, the pointed out inconsistencies between the statements of Prime Minister Nawaz Sharif and his children, and called for them to provide a record of the ownership of the London flats from when a law regarding bearer certificates was passed in 2002 till the time they were transferred. “We want the court to give a verdict on disqualifying the prime minister,” Bukhari demanded as he resumed his arguments. Justice Azmat Saeed Khosa remarked that going by Bukhari’s definition, Maryam Nawaz was dependent on Hussain Nawaz. “Even now one has to determine when the London flats were bought,” he added. When Justice Khosa remarked that a ruling could not be based on newspaper clippings submitted as ‘evidence’, the PTI counsel replied that the court had ruled on the basis of newspaper clippings in the past. With present situation of justice in Pakistan it does not look like that Nawaz Sharif would be charged for his corruption. PTI's lawyers are also acting like if it is a stage show!